Which do you prefer? Vote for your favorite by clicking the image you like and tell us why in the comments below. Technically, both of those are "mobile", right? But which would you choose to live in it? 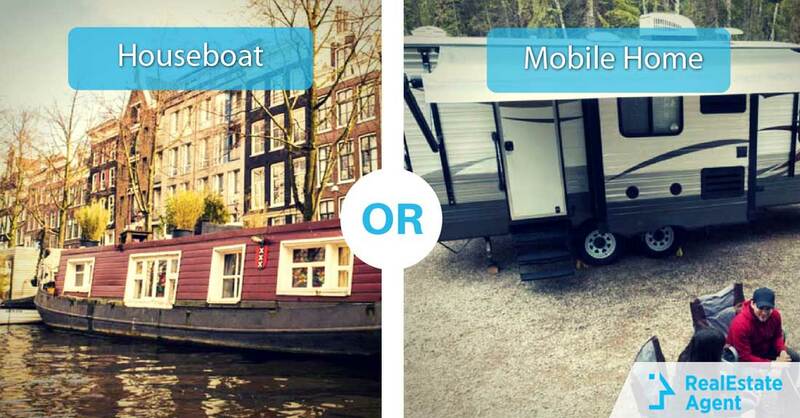 A houseboat or a "home on wheels" type of mobile home? A houseboat, allows you to explore the world. You can sail whenever you want wherever you want; the world is 71% made of water! People have been living in Houseboats for centuries and, though it has its challenges, when done right, it's very charming and freeing. With the rise in real estate prices, a lot of non-sailers have been turning to houseboats as a more affordable alternative housing. A mobile home like an RV, a motorhome or a "home on wheels" type of alternative housing? Mobile homes are as freeing as houseboats but more practical in a way; although the world is majorly made of water, people do live on the land, so, with mobile homes you can actually explore more places and interact with more people. When you travel with a houseboat, at best, you'll spot dolphins, sharks and whales. When traveling with mobile homes you get to see the monuments, people walking by and the whole 9 yards. Now, when it comes to the housing itself, you have a lot of depreciation to deal with and maintenance. So, who's your knight in The Non-traditional Homes Battle? Between those two what would you pick as your alternative housing?